Our culture has deteriorated in many ways. And one of the core problems is the disappearance of simple good manners. One local Virginia coffee shop owner decided to do something about that, and ended up sparking a firestorm. 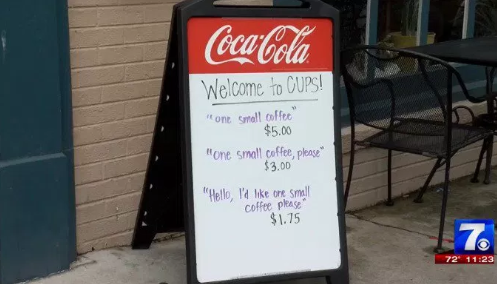 Austin Simms was tired of dealing with rude customers at his CUPS Coffee & Tea shop in Roanoke, Virginia. So, he decided to offer discounts to customers who actually asked “please” when ordering. He provided an even bigger discount to those who bothered to greet him personally with a simple “hello” upon entering the shop. And Simms put a sign out front to notify would-be customers of the various discounts on offer. Now, that likely did NOT sit well with millennial snowflakes who believe being rude is a civil RIGHT. Of course, it is everyone’s right to be rude if he or she chooses. But that doesn’t mean there aren’t consequences for doing so. Simms’ discounts quickly caught the attention of local, state and national media. Let’s hope his simple message resonates and results in people behaving better.